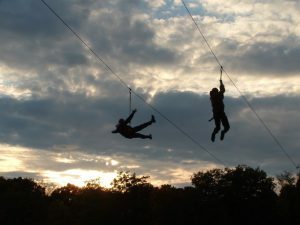 While many people still think of zip line riding as a dangerous activity best left for spies in the movies, it has become a fairly common sport. These days, many state parks and other recreation centers feature zip line courses, with a single private company overseeing operations. They are supposed to be safe so that while it appears to be quite a thrill, one should not get hurt while using a zip line. The manner in which they are made safe is through the use of redundant safety harnesses and safety straps designed to prevent a rider from falling and being injured. However, according to a recent news feature from ABC News, things do not always go as planned, as evidenced by the death of a 59-year-old woman using the zip line attraction at a state park in Delaware. Authorities say the woman was standing on a zip line platform while waiting to start her decent. She was about 35 feet high when she fell off the platform and died as result of the tremendous impact. She was still alive after hitting the ground but there was not much park first aid workers could do. They called 911, and EMTs arrived and attempted to stabilize the accident victim for transport to a local level-one trauma center. When she arrived at the hospital, there was nothing much doctors could do either, and she was soon pronounced dead. While police do not suspect anyone pushed her, they are conducting a full investigation, as they are not sure exactly what happened or how she was able to fall when she was supposed to be wearing adequate anti-fall gear. Witnesses she had just completed being trained on how to remain in her safety system when she started the course. She safely made it all they way to the fourth platform, which is one of the last platforms in the course. For some reason, witnesses believe she actually detached herself from the safety system, which is why she was able to fall to her death. They do not if it was intentional or unintentional at this time, or why she was not wearing the harness at the time of her tragic fall. Certain activities are inherently dangerous. Riding a motorcycle and skiing might be two of those activities. Using a zip line course might be dangerous or it might be considered very safe given the number of safety precautions taken. You would need to look at the total number of people injured while using a zip line to figure that out. You would also have to figure out the type of injuries. For example, straining and arm or leg on the safety harness is probably much more common than falling. For this reason, if you have been injured while participating in a recreational activity for which you were required to sign a waiver, you should speak with an experienced Boston personal injury attorney about whether or not you have a valid case. Just because you signed a waiver, as you are often required to do, does not mean you do not have case, but it is something you will have to discuss with your attorney.